This blog shows project documentations of various projects done by members of association of experimental electronics. Some projects are very easy and suitable for beginners, some are only for more advanced solderers. This is experimental electronics project to turn your old joysticks into nice sound devices with no external sound source needed. Here in Finland these you can find these very cheap from fleamarkets. You recognice them from smooth and quite long movements of the stick and of course a switch that says autofire or turbofire. The autofire circuit will act as oscillator and joysticks horizontal and vertical movement will be wired to control it. You might have problems fitting these inside the joystick. Make an external battery compartment. Small active computer speakers are probably the cheapest test amps you can find. Open your joystick to see what is inside. In this project we use 555 or cmos based circuit because they use only few components (In most cases 1 ic, 1 capacitor an 1 resistor) and are easy to do. When adding new components to circuit try different values with alligatorclips. To power this circuit battery + needs to be connected to pin 8 and ground (-) to pin 1 . In some cases the connections for + and ground are marked on the pcb. If not you can easily follow the copper traces under the board. At this point use alligatorclips to power your circuit. When the circuit is powered correctly you can probe the circuit with alligator clips connected to input of your test amplifier. Pin 3 is output in the 555 circuit, just follow the copper traces on the pcb. You should be able to find ticking or motor running type sound. The oscillator is running quite slow because of the original timing network (resistors and capacitor). After the resistor is removed solder two wires to the points where resistor was connected. Then solder other ends to one of the two potentiometers. One wire to middle pin and one to side pin. You might want to solder a resistor in series with the potentiometer so that the oscillators scale stays in audible frequency (try different values to find which value you need). Now moving joystick will change the frequency of the sound. Solder a capacitor between the output wire from circuit and output jack. The signal is quite strong so you might want to add volume control -> a resistor, trimmer or potentiometer to output line. WARNING.I do not recommend that you to plug this or any other experimental sound devices to your most expensive hi-fi audio equipment. You might end up having broken expensive hi-fi audio equipment. You can feed external modulation signal to the 555 ic. Simply solder a wire between a input jack and pin 5 on the ic. Modulation signal needs to be quite strong. If you build two noisticks you can use one to modulate the other. As always-> experiment to get the best results. After all wires, components etc. are soldered properly and everything seems to be working. Close the screws and your noistick is ready to annoy people around you with its horrible sounds. This type is the most fun because you can easily build more than one oscillator around the chip. So you can have an individual oscillator for x and y movements of the joystick with adding just few components. Only two different circuitry is presented here. You may (and probably will) find various others. 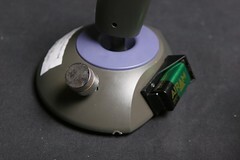 Same principles can be used to many other joysticks with hex inverter based circuitry. marked chip (like the second example: 74hc04 hex inverter) It will fry if powered with 9v! With these use two to four AA batteries instead. Follow the copper traces on pcb to see witch wires go to these pins or solder new wires for battery. Make sure you connect the power correctly because wrog polarity can kill the cmos ic. When the power is connected correctly you can probe the circuit with alligator clips connected to input of your test amplifier. You should be able to find ticking type slow squarewave sound. To make this sound adjustable just remove the timing resistor (R1) and replace it with either x or y potentiometer inside the joystick. You can also change the capacitor (C1) to change the scale of the oscillator (larger values to get lower and smaller values to higher frequencies). After the resistor is removed solder two wires to the points where resistor was connected. Then solder other ends to one of the two potentiometers. One wire to middle pin and one to side pin. You might want to solder a resistor in series with the potentiometer so that the oscillators scale stays in audible frequency (try different values). Now moving joystick sideways or up and down will change the frequency of the sound, depending on witch potentiometer is wired . The original circuit uses ½ of the chip to create the oscillator. The three remaining inverters will be used to create the other. You can copy the first oscillators circuit: a capacitor between pin 13 and 10, connect pins 12 and 11 with a drop of solder, connect pins 10 and 9 with a drop of solder and the remaining potentiometer between pins 13 and 8. When completed the circuit is the same as on the 4069 joystick. And here is the diagram. You can mix the signals to a single output from the two oscillators with resistors or diodes. Try both and choose the mixing network you like. Or you can use stereo output connecting one oscillator to right channel and one to the left channel. Solder a capacitor between the output wire from mixing network and output jack. The signal is quite strong so you might want to add volume control -> a resistor, trimmer or potentiometer to output line. After all wires, components etc. are soldered properly and everything seems to be working. Close the screws and your noistick project is completed.